Hello and WELCOME to The ThINKin' Spot!! It's not been that long at all this time and boy, do I have some exciting news for YOU! an all new Stamp of the Month Club stamp set!! stamp set and rumor has it there may be add on sets for later in the month too! photopolymer and they are filled with some of the most adorable images you will find anywhere!! Here's a little sneak peek of the new set that'll be coming out. I hope you love it! Oh, who am I kidding? How can you NOT love this little cutie? Squeeee!! Was I right, or was I right? Adorbsies. That's just all you can say. My favorite is her "teef" as my grandson used to call them. LOL! Teeth and eyelashes. Incredible detail on each and every stamp! from Stampin' Up! There are some incredible patterns and floral patterns in that particular paper pack and they really don't look all that Birthday-ish to me. A few are definitely birthday themed but not all. I've found I go to this particular stack for a variety of cards and projects. 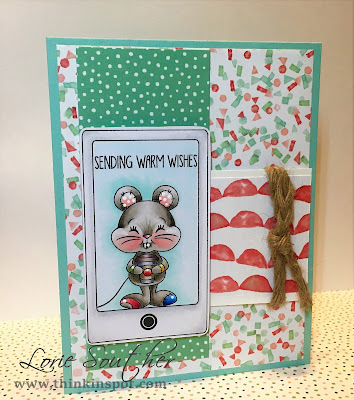 I'm not sure if it's still available from Stampin' Up!, but if not, and you're lucky enough to still have some of it to play with like I do, then... YAY YOU!! 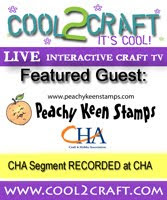 For all the details about Peachy Keen Stamps Stamp of the Month Club comeback and for details about how to get yourself signed up and on that happy mail list, head on over to www.peachykeenstamps.com. Get yourself signed up for email notifications, and be expecting an email from Kathy TODAY!! Have a blessed day and Happy Stampin'!